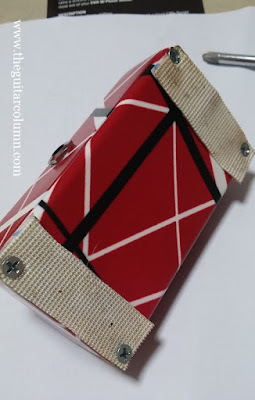 If you read one of my earlier posts on attaching pedals to Pedaltrain pedalboards without sticky Velcro, I wrote about using a rather cumbersome method involving non-adhesive Velcro straps and nylon cable tie. Two cable ties were looped around a pedal, torqued sufficiently, and Velcro straps were threaded through the cable ties from underneath and then tied to individual slats of a Pedaltrain pedalboard. Pedals were held in place securely and the idea proved gig worthy. But I'll be the first to admit it wasn't the most elegant solution. 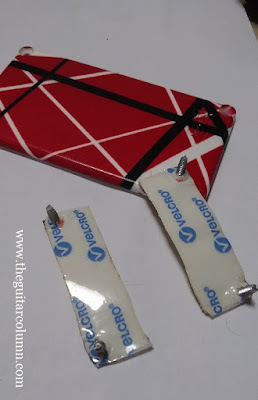 The cable tie was very visible, and there was the possibility of some pedal paint wear with prolonged use. It was also a bit of a hassle to remove a pedal or swap pedals around, not to mention that this method would only work with slatted pedalboards such as the Pedaltrains. 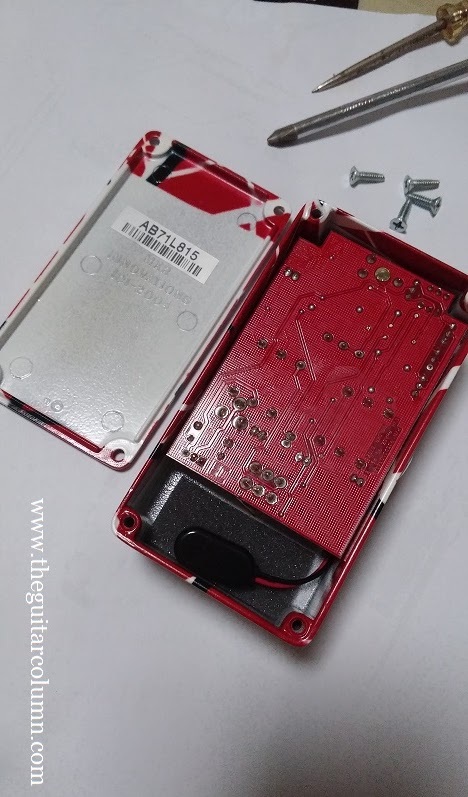 "I remove the screws from the bottom of the pedal, pierce some holes in some Velcro strips (non-adhesive) and screw them back in so the Velcro is screwed to the bottom of the pedal! Nice and tidy and no glue gunk." A great idea and one which I've copied and used with great success over the last couple of years. And also something I've been meaning to blog about for some time now. 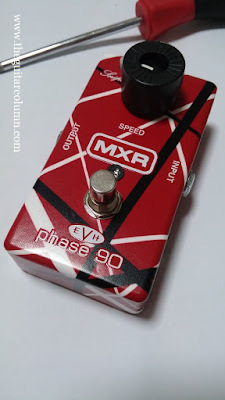 So when I got my hands on an MXR EVH Phase 90 today, I figured better late than never. The MXR EVH Phase 90 features a really cool paint job with the Edward Van Halen-approved black and white stripes against a red background. Even the baseplate of the pedal is painted in the same graphic -- not something you would want to stick patches of adhesive-backed Velcro, leaving gunky residue, or worse peeling off patches of the pedals paint job should you need to remove the Velcro later. The Velcro I used was taken off a regular MXR Phase 90 which, when placed before my Dunlop Band of Gypsys FuzzFace has started to sound a little too radical. The EVH Phase 90 is a little less swooshy and more vintage sounding, especially with the Script button engaged, creating a pleasant and not overpowering modulation for single-note lines and riffs. So off went the Velcro from my orange Phase 90. In the picture above, you can see how grotty the Velcro has become, living under that pedal all this while. 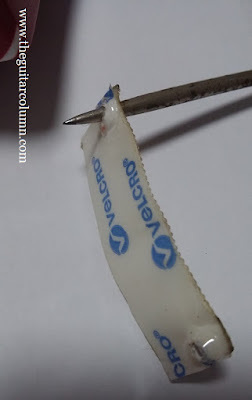 And just for illustration purposes, I show how I made the holes with a sharp pointed tool from an old screwdriver set that has been with me since the '70s! Notice also, how I left the plastic backing on the Velcro so as not to expose the adhesive. After making suitably sized holes in the Velcro, I simply threaded the four screws through and screwed the base plate back on. My estimation on the screw distance for one of the Velcro pads was a little off as you can see in the picture, creating a slight crimp in the Velcro. The perfectionist in me wanted to redo that particular strip, but then I realized that I had run out of white Velcro! 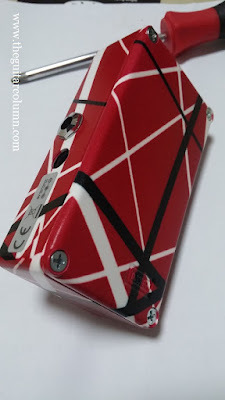 In a similar vein to all things Van Halen, check out my earlier review of the EVH Striped Series guitar. We just can't get enough of that black, white and red paint job!